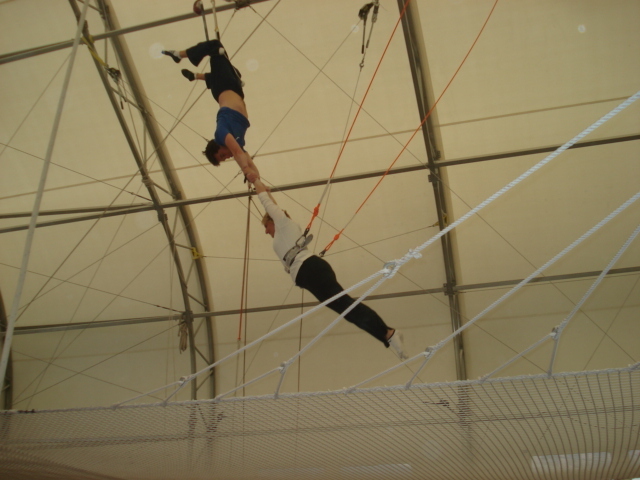 That middle aged-mom, on the flying trapeze. Yes, that would be me. In this, the middle aged-crisis part deux post. You’ve already read about my hair and my calamitous (if courageous) pole dancing escapades…but now you get to see me on the trapeze. Yes, really. That’s me up there in this video from the TD Bank Flip event at The Trapeze School of New York. A few weeks ago I went to the Trapeze School of New York with my friend, Rachel, climbed the ladder, grabbed the bar, and jumped. You know, just in case there was any doubt that I was deep into mid-life crisis mode. 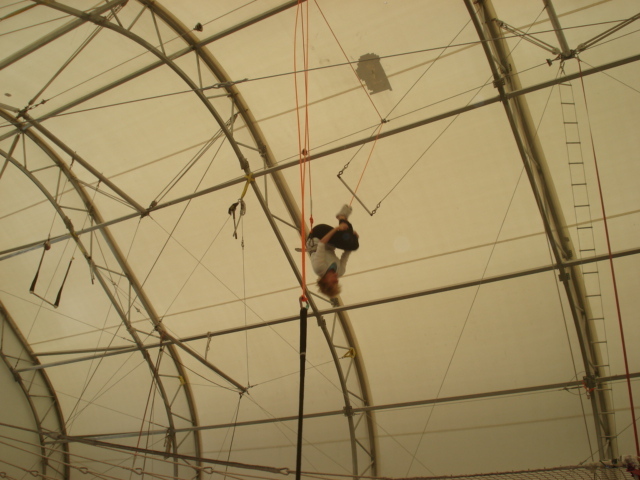 This is me doing a back flip dismount off the trapeze. And doing a catch with an instructor. Well, I thought so, except that there were other people in my class who were REMARKABLE. A dancer/gymnast type who had the most perfect, graceful, 2% body fat form ever, a woman who could hang upside down in a SPLIT! And they’d only done it once before. Of course they were both about 15 years younger than me. And had’t given birth, but still. I guess I should be used to it. I have always been “last picked for the team” girl. (or at least “last picked of the not total losers” girl) So the fact that I was there at all, swinging through the air, well, I was pretty happy. But then last week, I went again as a guest of TD Bank. Now, there are lots of reasons to love TD Bank. They open early and close late. They count my kids’ coins for free. They give out dog biscuits. (oh, and they have a lot of great banking stuff, too, including the opportunity to get a new Flip camera just for opening a checking account. You only have until June 5th – so hurry!) But the real reason I love TD Bank and always will is this: For the first (and let’s face it, most likely only) time in my life – I was the best one there!!!!! I know I had the advantage, I had done it before – but let’s not dwell on technicalities, shall we? Because of TD Bank, I got to feel, for the first time ever, what it’s like to be considered the best athlete in the room. Free ATM access at over 5,200 TD Bank and TD Canada Trust ATMs, plus they reimburse other banks’ ATM fees when you maintain a minimum daily balance of $2,500. But to me it’s BIG. Come on, you remember those days – standing out in the field during PE, praying that you’d at least get picked before that girl who was always talking to herself about rabbits while she incessantly twirled a lock of her hair? You don’t? Well, I do. And it wasn’t pretty. And it wasn’t fun. But last week, at the TD Bank event, I got to feel like the first picked for a change. Yes, for one, brief shining moment — I was a star. I even considered running away from it all (what all? I have no idea) and joining the circus…the middle aged circus. Instead, I just decided to hold on to the feeling by buying a ten class card. I might not be the best one the next time I go (ok, ok, so I won’t be ) — but I’ll always have the memory. So TD Bank, thanks for the memories. I”ll think of you every time I flip out! I just found your blog from a Mom-101 comment, and I think you are great. Consider me a new fan. I am subscribing to your RSS as soon as I submit this comment. Oh, I think you’re my only fan!!! Me too, new fan. 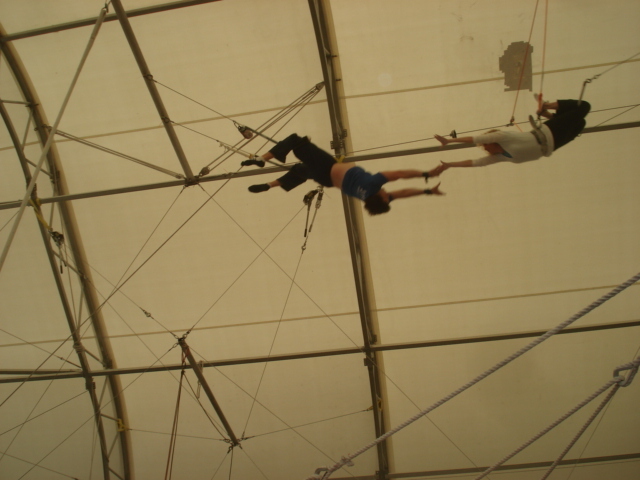 What a totally awesome way to spend a day, trapeze school. I write to write too – and trying new things. Thanks for your post on Mom-101 so I found you.